My mom was a master at the fine art of leftover technology – she could cook one great supper and turn the leftovers into great meals for days – and we never knew we were eating leftovers! 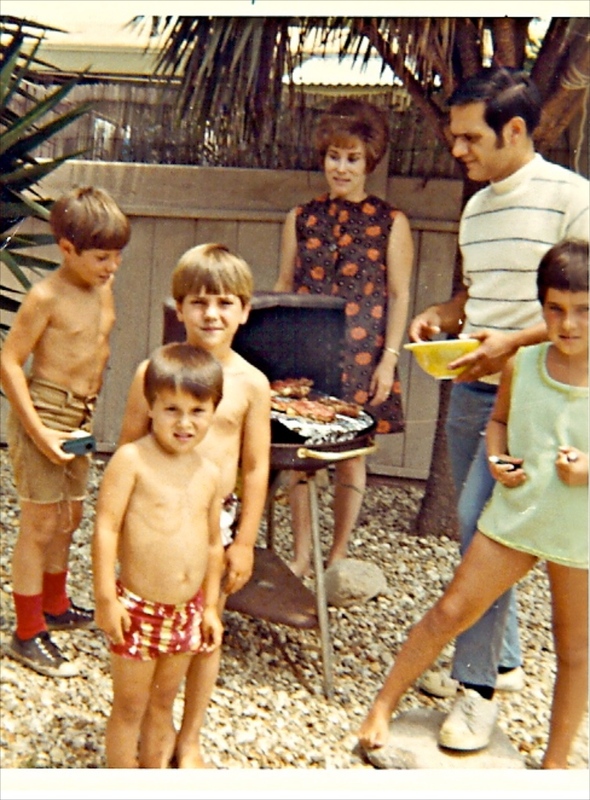 I didn’t know it at the time, but mom used feed a family of 6 on $11 / week (1960’s dollars). How? She cooked everything from scratch and cooked enough ahead so there was always something healthy in the refrigerator. In my house we do things pretty much the same, but with a better budget and more international flair. 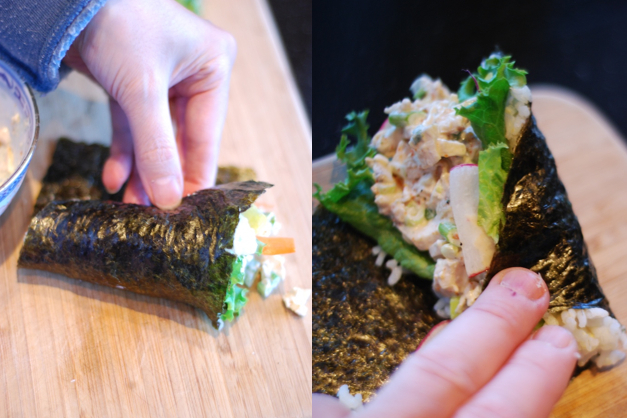 Here is a common meal from our house – today we’re turning yesterday’s leftover rice, veggie and chicken into a family classic from Japan – Temaki – a form of sushi that’s wonderfully easy, healthy and delicious! Temaki Zushi – leftover rice on nori with veggies and chopped leftover meat or fish salad – easy, healthy and delicious! 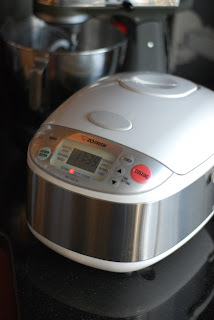 If you love rice, a rice cooker is a must! 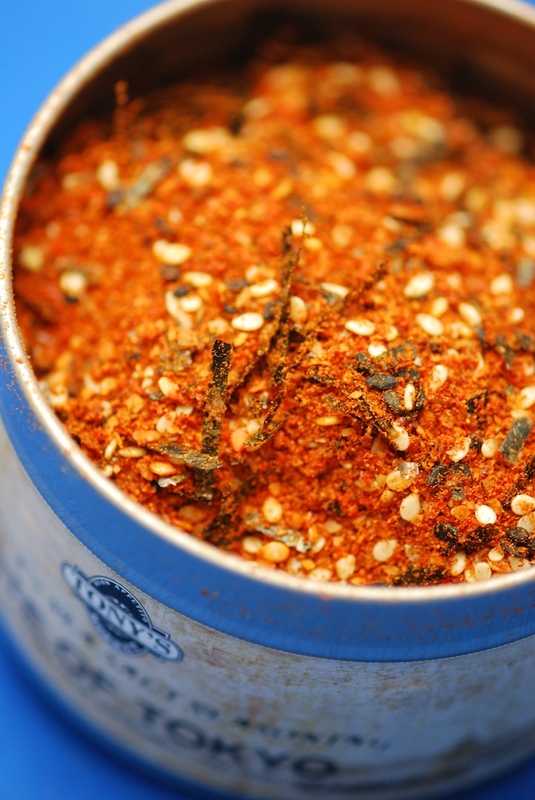 No more boiled over pots or scorched pans – and perfect rice every time! We’re aficionados and cook it almost daily, so I chose a quality induction unit from Zojirushi of Japan, pricey yes, but well worth it for our family. You can buy a great rice cooker online, or in an Asian grocer, like H-Mart in Aurora – but expect to spend over $100 for a good one that will last a lifetime. A rice cooker keeps your leftover rice warm for more than a day with no drop in quality. 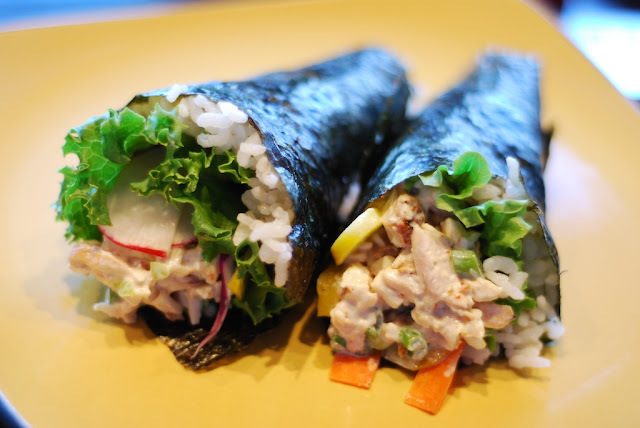 For temaki, choose short grain Japanese rice, I suggest Nishiki brand – available at Tony’s. Today I had a piece of leftover grilled chicken, but steak or ham or fish or shrimp, or even a can of tuna or salmon works great! Slice or chop, add a dash of mayo (optional) and season (I suggest my Taste of Tokyo Rub, pictured right), a couple minced scallions, maybe some minced cucumber, bell peppers, celery – whatevah! Nutritionists are discovering what the Japanese have known for ages – sea vegetables are wonderfully healthy, and delicious! We always keep nori on hand (roasted seaweed sheets for sushi) in a Ziploc bag. Split whole sheets to make rectangles. Next I picked some lettuce, peppers, radishes and carrot strips from a leftover salad – or try strips of cucumber or zucchini; again, whatever you have on hand will do. 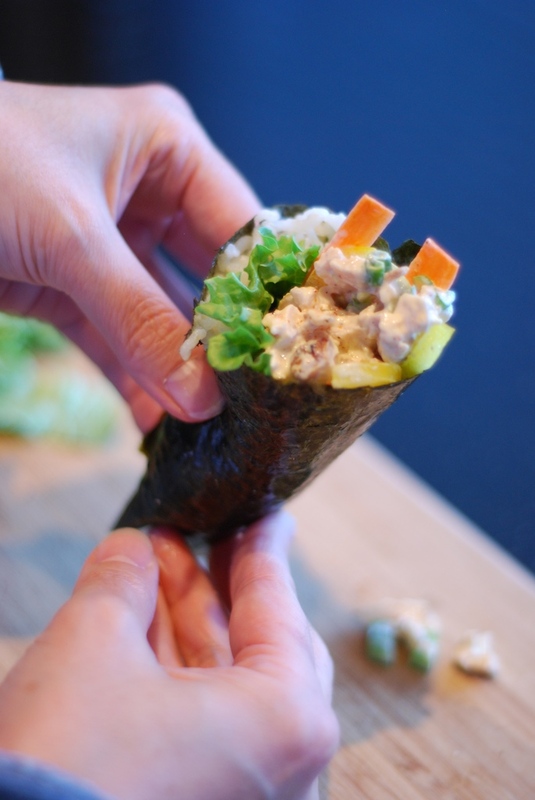 Think of temaki as a salad with meat wrapped in Nori seaweed. The fillings are up to you – use enough to form a cone, but don’t over-stuff. 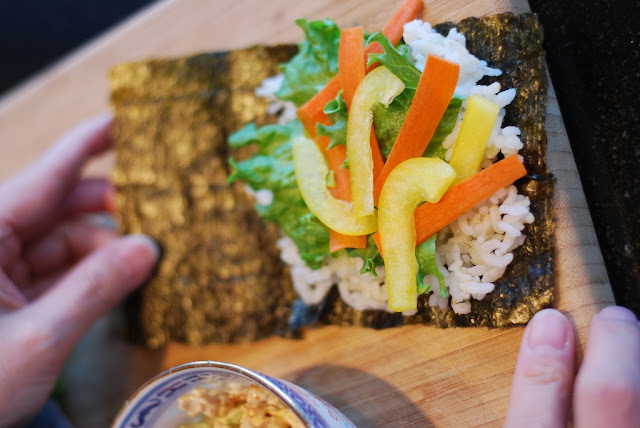 Place some warm leftover rice on one side of the nori, top with veggies of your choice, a little of the cold salad and roll it up. It’s easy to make a bunch of these in a hurry – only problem is they disappear as fast as you can make them! 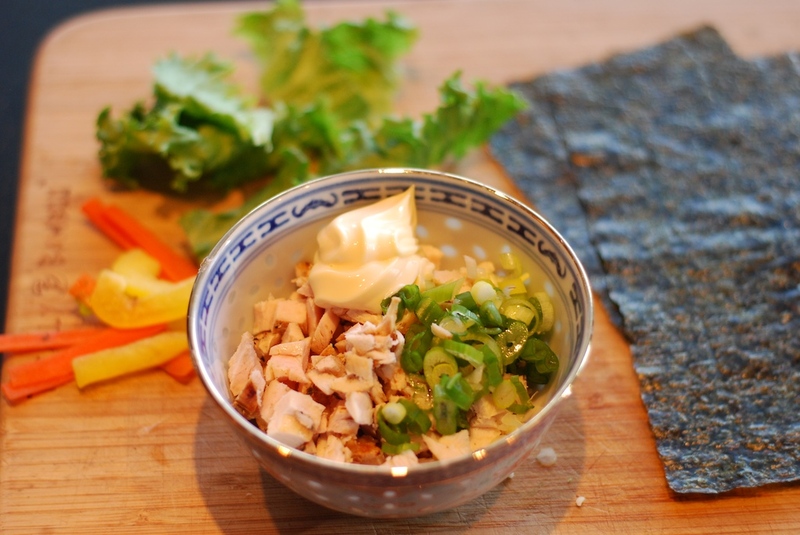 Just roll it up like a cone – it’s really easy! 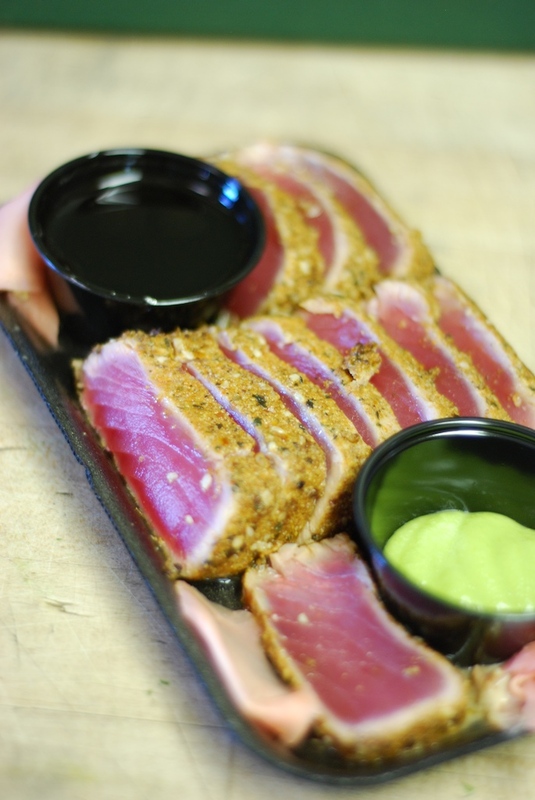 If you want to use seared or raw fish, start with one of our sashimi grade Tuna Saku bars (raw or seared), mince and season with my Taste of Tokyo Rub, minced scallions, a splash or soy sauce and a dash of mayonnaise if you like, serving with wasabi and soy sauce. For the best tuna temaki ever, use one of our packages of Seared Tuna Tataki (pictured at right), rest to take off the chill, chop, and then blend with mayo and scallion – dee-lish! Serve the temaki with the sauces and ginger included. My wife can make temaki faster than I can eat it! I prefer fish – especially leftover salmon, scallops or shrimp – but almost any leftover will do. How about ham, pineapple and scallion? Steak, bell peppers and onions? Chicken and grilled veggies? Let your imagination run wild! Pick up a pack of nori, my Taste of Tokyo Rub and some Nishiki rice next time you’re in Tony’s, and turn your leftovers into a Japanese family favorite in no time! No raw fish here – but a great option for the sushi and sashimi lover. Share with your foodie friends!